Presented jointly with the Institute for Big Data Analytics (IBDA) at Dalhousie University and sponsored by the Canadian Statistical Sciences Institute and the Atlantic Association for Research in the Mathematical Sciences, this workshop will give an overview of highlights of the thematic program on Statistical Inference, Models and Learning for Big Data, will showcase current IBDA student projects and will present research at IBDA on text mining, high-performance computing, visualization, bioinformatics, and privacy. 9:00 - 10:20 Panel discussions on training for data science at the undergraduate and graduate levels. 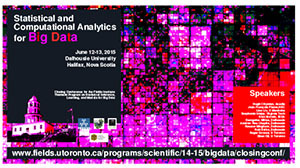 This workshop is immediately before the annual meeting of the Statistical Society of Canada. Consult their accommodations page for links to accommodations in the area.